Slow Church and a number of related projects of mine in recent years have focused on the central themes of connection, community and conversation. Given that all three of these themes converge online in social media, I am always eager to see what others are saying about churches and their use of social media. Meredith Gould’s book The Social Media Gospel: Sharing the Good News in New Ways is the latest in a loose series of recent books that explain social media to churches, and help them reflect on how to use these online tools in their own context (Most notable of the books I have in mind is Bruce Reyes-Chow’s The Definitive-ish Guide For Using Social Media in the Church, as well as the talks Carol Howard Merritt has given in recent years following her book Reframing Hope). 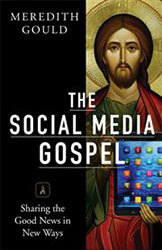 Although Gould’s work shares much in common with the work of Bruce Reyes-Chow and Carol Howard Merritt, specifically introducing particular social media platforms and examining how they might serve to deepen connections within churches, one thing that stood out about The Social Media Gospel is the sociological dimensions that Gould brought to the book, particularly as explored in the first part of the book “Frameworks for understanding,” which includes chapters on theological frameworks, generational frameworks, learning styles and personality types. These frameworks recur throughout the remaining parts of the book, and are particularly helpful in adding nuance to the ways that churches might utilize social media, given the particular demographics of their congregations and neighborhoods. The book’s short, easy-to-digest and chapters cover a range of topics, and make the book especially well suited for discussion in the congregational context. The chapters in the latter half of the book (and the appendices) warn of some of the most pressing dangers of social media (online conflict and social media burnout), and address key issues in implementing social media in the church context: best practices, social media policies, and communications audit. [Everyone] seems to agree that digital technology provides ways to prepare for sacraments, not receive them. Confusing sacramental preparation or online participation (e.g., attending and tweeting a live-streamed wedding or baptism) with receiving a sacrament is counterproductive. Don’t do that! As we regularly argue here on the Slow Church blog, conversation is essential to the life and well-being of churches. Social media can be extraordinarily helpful in expanding a congregation’s conversation, both by drawing new participants into the conversation and by offering online venues for extend the conversation. Meredith Gould’s The Social Media Gospel is a particularly helpful resource for churches that are seeking to make sense of social media and trying to find fitting ways to use it effectively within all the particularities of their own contexts. I highly recommend this book for churches seeking to understand and implement social media, though I would recommend that those who would facilitate conversations about social media in their church read a variety of books, including this one and Bruce Reyes-Chow’s book mentioned above.